By Ian Keys, MEC Security. Surveillance systems, even though they have become almost a necessity in today’s world, are and will always be a grudge buy. At present, in a market segment where there is no choice because real-time surveillance is an absolute necessity, e.g. the entertainment industry, because of ‘tradition’ and lack of understanding of the security offered by Wi-Fi systems, users stick to the deployment of wired equipment. The deployment of wired equipment is lengthy, costly and fraught with difficulty when considering the infrastructure requirements and the enormous cost associated with maintenance and replacement of infrastructure over a period of time. In other market segments, surveillance systems are the Cinderella of all the security installations and therefore are always the last segment of any project that receives the necessary attention. The result is a limited budget and extremely tight timelines. In turn, service providers must sacrifice on quality just to be able to make a profit and ensure the future of their businesses. This reality is something that is giving the security industry a bad reputation due to poor service delivery as well as unrealistic expectations of clients from low budgets. The question that arises from this is very obviously, what can we do to ensure the quality and reliability of our systems and save customers money and time? Why has the surveillance market not made the transition to Wi-Fi deployment of the infrastructure network? Wi-Fi networks have two distinct advantages that can address the problems in the surveillance market. Wi-Fi network deployment can provide up to 50% financial saving if compared to a wired solution and installation time can be cut by as much as 80%. With the limitations of data transfer rates and limited security features, Wi-Fi surveillance has been implemented only in domestic or very small systems. That is the main reason the quality of Wi-Fi cameras supplied for surveillance purposes are below the standard of wired IP cameras. Enterprise wireless addresses all the issues that the surveillance has for not fully deploying surveillance systems on a wireless network. 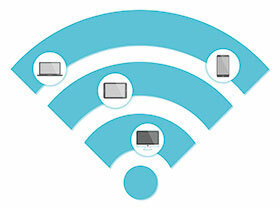 Firstly, every IP device can be Wi-Fi enabled by connecting a client AP (access point). Data throughput on dual-band access points can handle up to 2.2 Gbps and enables dense deployment of multiple networks. Multi-level authentication and isolation makes it easy to manage network security, which is a serious concern when implementing a CCTV system. Data security should be a top priority when implementing a wireless surveillance system. Wireless signals often propagate beyond physical barriers, which makes the risk of someone breaking in to your wireless network an imminent threat. Simply securing a wireless network using authentication and encryption just isn’t enough. Enterprise WLAN security tools can help mitigate these threats. WPA2-Enterprise generally requires a Radius server which handles all the authenticating access. Products like IP-COM’s AP Access Controllers are dedicated devices that not only manage the authentication of users, but will also provide additional network management functions like intelligent user load balance, auto channel and power assignments, full WLAN analysis and user access management, to name but a few. These access controllers manage the security of the overall network with a temporary secure public-key encryption which scrambled the keys using a hashing algorithm to prevent tampering. Enterprise mode still has vulnerabilities. Hackers can setup a fake AP and Radius server in hopes of obtaining login credentials. With IP-COM’s AP Access Controllers, rogue APs can be detected and stopped from connecting and broadcasting on the network. By providing permission to only certain devices and removing the ability to authorise new servers from users, these attacks can be prevented. All the necessary protocols to protect the information on your network has been implemented. However, the critical element would be the correct configuration to protect against all threats. Enterprise Wi-Fi management features would provide an absolute game changer for service providers in managing and maintaining their systems. Make network changes up to 98% faster, save up to 80% on operational costs, and detect threats in hours instead of days. These are a few of the multitude of advantages that these systems provide. In conclusion, every surveillance service provider should be willing to look at deploying enterprise wireless infrastructures to stay competitive. Apart from the financial savings that can be experienced, the additional management features and simplicity these systems should very quickly become the market standard.